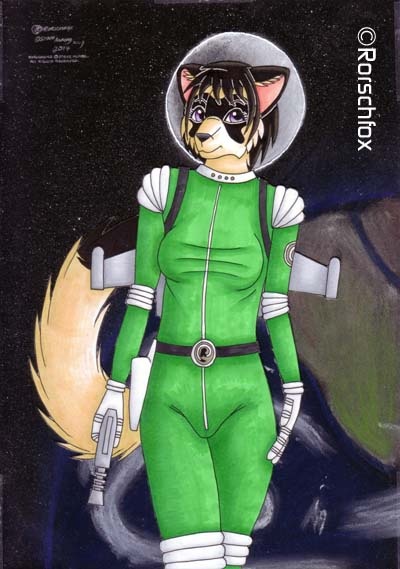 This vixen (along with Space Vixen Blaze) *may* be making an appearance in the artshow at ConFuzzled later this year. Media info: inks, Copic markers, gel pens, acrylics and oil pastels on Bristol Board, acetate and black card. Raquel "Rorschene" Lightfoot is ©Steve "Rorschfox" Alford. All rights reserved. Being white and black, Rorschene can get away with pretty much any colour. But being from the "Emerald Isle", she does have an affinity for green. She is a very special character to me. So you'll be getting to see a lot more of her soon!